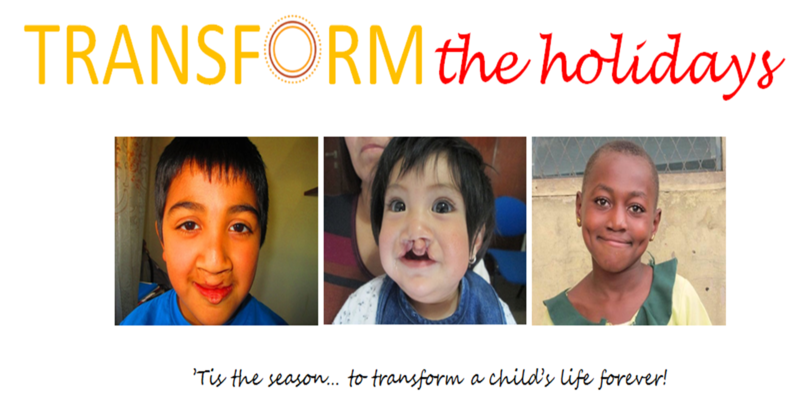 This holiday season, Transforming Faces invites our amazing supporters to help us transform the lives of children with cleft lip and palate. Roughly one in 700 babies are born with cleft lip and palate, and, while it is treatable with surgery and rehabilitation, comprehensive cleft care information and services are inaccessible or altogether unavailable in most parts of the world. Not sure what to ask for? Helping put a smile on a child’s face would make a pretty amazing and meaningful gift! Set a goal and collect pledges to help you achieve it. Download our Transform the Holidays Kit for ideas and information to get you started. For questions or assistance, please contact Courtney at 416-222-6581 or by email.